Considering the “study” is authored by Dusty Howitt of the Partnership for Policy Integrity and is funded by three staunch opponents of all things fracking related (Earthworks has declared a “war on fracking,” for example), it comes to no surprise that a report ominously entitled “Toxic Secrets” reads like a greatest hits of debunked activist claims and scare tactics regarding fracking fluids. That may well be why the media essentially ignored it. Here are the study’s most egregious claims followed by the facts. FACT: As a footnote at the end of this claim in the report plainly states that the U.S. Environmental Protection Agency (EPA) is provided all pertinent information by chemical manufacturers: “The information is shared with EPA, however,” the report states. Chemical information is also provided to health and emergency officials. The study chooses to ignore the fact that the federal Community Right-to-Know Act requires operators and chemical manufacturers to submit and regularly update detailed Material Safety Data Sheets and provide them to first-responders and other emergency personnel in case of an on-site accident. In the rare cases where contamination (not from the fracking process itself but from activities associated with drilling) occurs, these comprehensive MSDS sheets are provided to the necessary parties. State regulators are also made aware of chemicals used in fracking fluid and have access to all the information they need regarding their safe use. As for the states not highlighted in green above – it just so happens none of them have significant oil and gas development. According to the Energy Information Administration (EIA), Oregon’s got about two dozen gas wells; Arizona’s got five, and Maryland has seven. 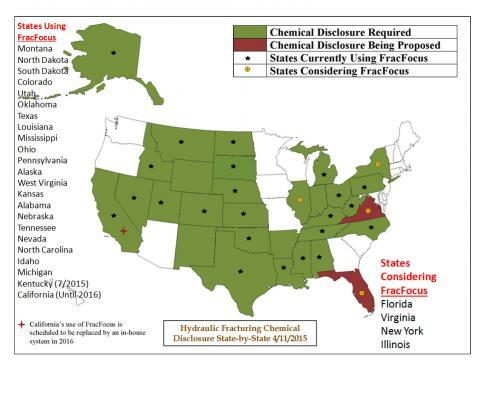 All of the other states that do not require submission to FracFocus also have NO oil and gas production! As for the states listed above listed as considering FracFocus (bottom right corner)? There is currently no shale development in Illinois (even though reporting to FracFocus will be required when/if any shale development occurs in the Land of Lincoln). Legislation requiring disclosure to FracFocus is expected to be signed by the governor of Virginia this year. In Florida there is currently has no shale development. And, of course, New York has banned fracking. Companies claimed exposure assumptions as confidential for at least 55 of 70 high volume chemicals… For at least 59 of 70 high volume chemicals, companies asserted confidentiality claims for the chemical name, and for at least 52 out of 70 they claimed confidentiality for the Chemical Abstracts Services (CAS) numbers (unique identifiers for chemicals). This report follows suit with numerous calls by environmental activists that no CBI withholdings should be allowed. But these groups fail to understand there are unique combinations and additives that developers have invested many years and many millions of dollars into developing. Without protections for this confidential business information, the companies that developed the additives would lose business and jobs as their competitors could simply copy their products for free. In other words, chemical disclosure is much more about protecting intellectual property than disclosing information from the public. So even though examples such as this surfactant aren’t considered a risk or hazard to human health or the environment because the company in question here doesn’t provide the molecular breakdown of it on the form, fracking opponents often consider the entire disclosure to be unacceptable and use them as examples of industry “hiding” important information from the public. The U.S. Energy and Commerce Committee’s Hydraulic Fracturing Report indicates that some fracking companies do not even know some of the “off the shelf” chemicals it they purchase from third-party suppliers. That is because those third party suppliers also have the right to disclose some chemicals as confidential business information (CBI), just as any U.S. company has the right to protect its intellectual property. Again, such instances are much more about protecting intellectual property than disclosing information from the public. FACT: Activists focus is on identity of chemicals themselves as the chief indicator of “inherent risk,” ignoring the fact that concentration and exposure are two of the biggest factors when it comes to levels of danger to the public – not the chemical itself. Chemical additives comprise just .49 percent of typical fracking fluid solution. And by both weight and volume, the most prominent of these materials is a substance known as “guar,” which is an emulsifying agent more typically found in ice cream. So the percentage of fracking solution comprised of chemicals other than a chemical used to make your favorite Dairy Queen treats is actually even lower than .49 percent. Granted, some ingredients used in fracking could affect your health, but only if you were exposed to them in high enough quantities. That said, it is essential to understand concentration of these elements is far below levels necessary to pose a threat. The latter two requirements are simply not met by fracking fluids, which illustrates why the EPA and Ground Water Protection Council have both released extensive studies declaring fracking fluids non-threatening. Furthermore, the average number of additives used in frack job is 14. This is based on a recent EPA report analyzing fluid composition and water volumes used in fracking from more than 38,000 disclosures from FracFocus 1.0 filed between January 1, 2011 and February 28, 2013. The data covered records from 19,700 oil wells and 18,300 gas wells from approximately 428 operators in 406 counties across 20 states. While the EPA found nearly 700 unique ingredients reported across the country for additives, base fluids, and proppants, the “median number of additive ingredients per disclosure for the entire dataset was 14.” In other words, each frack job uses approximately 14 chemicals, not 700. Also, according to a recent Business Insider article identifying the 10 “scariest” chemicals used in fracking fluid, it is worth noting that each are found in common house hold products, including: methanol (soap), BTEX compounds (shampoo), hydrogen fluoride (wheel cleaner), naphthalene (carpet cleaner), sulfuric acid (dish soap), crystalline silica (glue) and formaldehyde (car wax). Turns out, the 10 scariest chemicals used in fracking aren’t that scary at all. FACT: Leaks and spills are uncommon, and the EPA’s recent landmark fracking study finds no evidence of fluid migration. First of all, it is essential to understand that spills and blowouts do not occur during or as a result of the hydraulic fracturing of a well, as the EPA’s landmark draft assessment of fracking and groundwater confirms. EPA actually found the number of cases of groundwater being impacted by development activities to be “small” when compared to the hundreds of thousands of shale wells drilled between 2006 and 2012. That EPA study also determination that well-casing failures were exceedingly “rare” – a direct retort to activists who have made “well integrity” their top talking point. Further research confirms that well-casing failures are exceedingly rare. An August 2011 report from the Ground Water Protection Council examined more than 34,000 wells drilled and completed in the state of Ohio between 1983 and 2007 and more than 187,000 wells drilled and completed in Texas between 1993 and 2008. The report showed a well failure rate of just 0.03 percent in Ohio and 0.01 percent in Texas. Also, a recent report compiled by the Associated Press from Pennsylvania Department of Environmental Protection (PDEP) data found that well-failure rates in Pennsylvania since 2005 are just one-third of one percent. The EPA report also found, “[V]ertical separation between the production zone and drinking water resources protect drinking water” as the reason there was no evidence of fracking fluids migrating into aquifers from depth. Fracking treatments are typically conducted a mile or more below the surface. Aquifers are typically only a few hundred feet deep. So there are literally thousands of feet of impermeable rock separating aquifers from where fracking occurs. It is also important to note that the researchers used the Concerned Health Professionals of New York’s Compendium of Scientific, Medical, and Media Findings Demonstrating Risks and Harms of Fracking (Unconventional Oil and Gas Extraction) as a “major source” for compiling their data on leaks, blowouts, leaks and underground migration. Of course, an EID whitepaper released last year highlights the fact that this source of information was composed of research papers written, peer-reviewed and funded by anti-fracking activists. In predictable fashion, this report attempts to perpetuate anti-fracking myths regarding both the dangers and alleged secrecy regarding fracking fluids with a repackaging of the litany of distortions and out-right falsehoods. But fortunately, the very entities and sources the report try to pin on alleged secrecy and disclosure of the potential harms of fracking fluids – the EPA, state regulators and FracFocus – actually shed light on how activist fear mongering is completely overblown.